The third time proved to be the winner for Dmitry Kraskovsky when he suggested a unique solution to MultiCare Auburn Medical Center’s generation needs. The first two bids for improving the generators at the hospital in Auburn, Washington, didn’t quite meet the facility’s needs. Then, Dmitry came up with a hybrid paralleling system for the MTU generators. “This design was exactly what hospital officials wanted from the new generator system,” he said. MultiCare needed a new generation system to support a massive renovation at the Auburn facility. The hospital added an adult psychiatric wing, completely renovated the emergency room and added new heating and boiler plants. 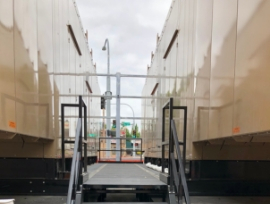 Mike Atchley, our project manager, faced the daunting task of fitting the large MTU generators needed to power the expansion into an extremely small space. The MTU units, which each provide 2000 kW at 4,160 volts, were engineered for an N+1 configuration. This allows the first generator to take the load and once it’s stabilized, the second generator shuts down. The backup system is typical for hospitals, data centers and other mission critical operations. Dmitry and the Power Generation team has worked with MultiCare on several projects at various medical centers in the Seattle area. Their expertise and experience is what enabled them to continue tailoring the generation design until they found the right configuration for the Auburn site. Generators were only part of the job. Just as important were the fuel tanks. Hospitals require enough fuel to run the generators for 96 hours. Each generator consumes 147 gallons of fuel an hour. An equally creative configuration for the fuel tanks was employed to achieve the necessary fuel storage capacity without using severely oversized fuel tanks. The final piece to the project was building an enclosure to dampen the sound and contain the generators. The units that were designed for Auburn lowered the generator noise to 68 dB at the nearest property line. 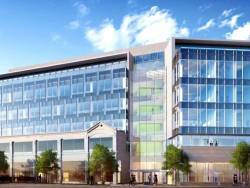 The unique solution to the Auburn site’s needs was critical in designing a system that best fit MultiCare’s needs. It’s not the first time we’ve been able to serve the not-for-profit health care organization. “Knowing the organization and working with them on several projects definitely helps in our ability to accurately diagnose the power generation needs that are unique to each facility,” Dmitry said. 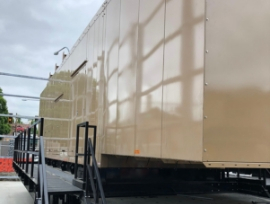 Pacific Power Group (PPG), a leading provider of power generation products in the western U.S., recently supplied a complex backup power solution for the innovative research organization Allen Institute for Brain Science in Seattle. Critical to the Allen Institute’s on-going research to understand the brain, the backup power solution supplied by PPG safeguards the Institute’s vital data and ensures that their new state-of-the-art facility will continue operation in the event of an emergency or loss of power. Pacific Power Group was selected by Valley Electric to assist with engineering and fine tuning specifications for the Allen Institute’s complete power solution. 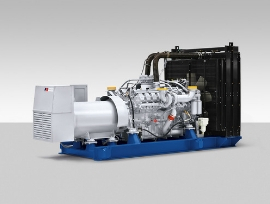 Two 1250 kW MTU Onsite Energy generator sets were selected to provide backup power due to their reliability and history of superior power support within critical health care facilities. MTU Onsite Energy gensets are trusted in health care facilities around the world due to their industry-leading average load factor and superior design and engineering, which provides peace of mind to medical professionals and their patients. Once final design and selection took place, logistical requirements mandated that the 30,000 lbs. generator sets be lowered into the Allen Institute’s new building while under construction.